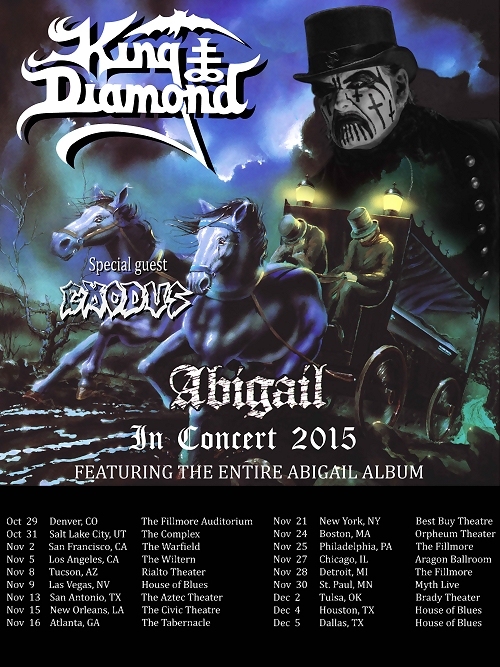 Thrash metal giants EXODUS are very pleased to announce their upcoming support of headliners King Diamond on their forthcoming “Abigail In Concert 2015” U.S. tour. The tour begins in Denver, CO on October 29th and tours throughout the contingent states, coming to a close in Dallas, TX on December 5th. This tour will feature King Diamond performing their classic 1987 album Abigail in its entirety each night. The general on sale for tickets begins this Friday, August 7th at 10am ET – don’t miss this rare experience! Next month, EXODUS will take part in the Motörhead’s Motörboat Cruise, departing from Miami, FL on September 28th. Motörhead’s Motörboat offers guests a once-in-a-lifetime opportunity to share an experience with their favorite bands and to see unforgettable performances on various stages throughout the ship and on the island of Great Stirrup Cay. The full lineup for Motörhead’s Motörboat is as follows: Slayer, Motörhead, Anthrax, Suicidal Tendencies, Hatebreed, Exodus, Corrosion of Conformity, Phil Campbell’s All Starr Band, Crobot, Motor Sister, KYNG, Brian Posehn, Fireball Ministry, Huntress, Big Jay Oakerson, The Shrine, Others, No Words, Budderside, Sonia Harley, and The Dead Deads. Visit www.MotorheadCruise.com to reserve a stateroom. EXODUS also just announced their upcoming performance at Inferno Festival, taking place on Wednesday, March 23, 2016 in Oslo, Norway. Please visit this link for more information and go here to purchase tickets.